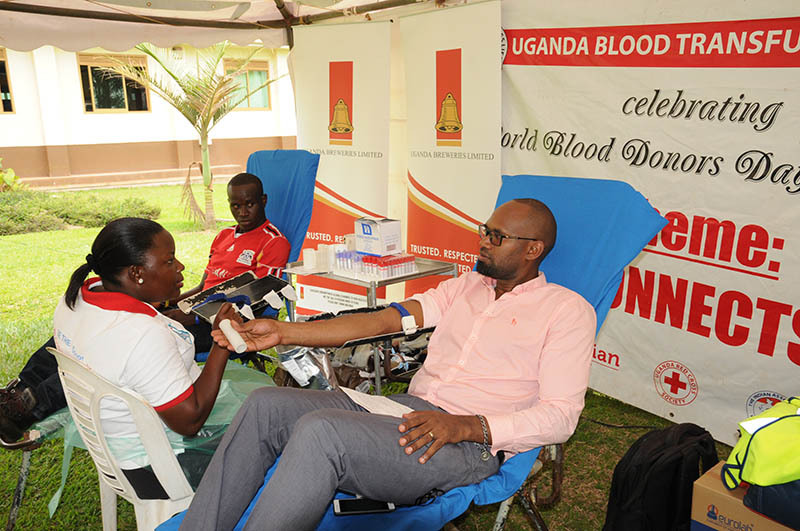 The national blood bank has been boosted with 433 units of blood following a successful week-long blood drive championed by Uganda Breweries Limited in partnership with Uganda Blood Transfusion Services (UBTS). This was in response to an appeal for safe blood in country. The drive which was also aimed at raising awareness and collecting blood for the Uganda Blood Bank was held from Monday, September 3rd to Saturday, September 8th 2018 at five locations: Nakawa Market, Uganda Breweries Portbell, Luzira Market, Kireka Market and Mukono Market. Rhona Arinaitwe Uganda Breweries’ Communications and Sustainability Manager expressed he gratitude towards all those who responded to the call for blood donation. “The drive was a success as many people heeded to the call for blood and turned up in large numbers at the various collection points. However, this is not enough because there’s still need for more blood. I encourage each and every one to continue visiting health centres near you to support the lifesaving mission of giving blood for those in need.”Arinaitwe said. UBTS at the beginning of the year made a rallying call for companies to join in helping to raise awareness but also help in filling the blood shortage that the country was experiencing. According to World Health Organisation (WHO) Uganda has an annual demand of about 340,000 units of blood, but falls short by over 100,000 units. The Organisation recommends that 1 per cent of blood be collected annually from the population. Last year, only 260,000 units were collected against a targeted 340,000 units in Uganda. Blood donors can still donate at the national blood bank in Nakasero and at UBTS regional offices in Gulu, Arua, Fortportal, Mbale ,Mbarara, Masaka. The drive which was also aimed at raising awareness and collecting blood for the Uganda Blood Bank was held from Monday, September 3rd to Saturday, September 8th 2018 at five locations.